A few posts ago, I mentioned I would write about an experience I had on August 1st of this year. As you can probably guess by the title of this post, I experienced LIVE music. That’s to say, I went to an outdoor concert which had five bands playing over several hours. Before I get to my concert experience, I want to share a little background. I mentioned in a previous post (you can view it here) I grew up in a musical family. Music was a big part of my life, as it is with most teenagers. I listened to and played music from all genres, rock, country, swing, jazz, blues, classical, you name the genre and I listened to it. As an active teenager, I attended my share of concerts. As our boys grew up, my wife and I took them to concerts so they could enjoy seeing and hearing the music live. A few years ago, while attending a KISS concert with my sons, I realized all the music was the same. All the notes, the vocals, the beats, everything was the same. I could no longer differentiate between songs, instruments, vocals, I was done. I stopped attending concerts, I stopped attending any live performance at all. Now, I have cochlear implants. I am listening to music again. The next logical step would be to attend a concert and see if I could enjoy live music, not just live music but music I didn’t know. 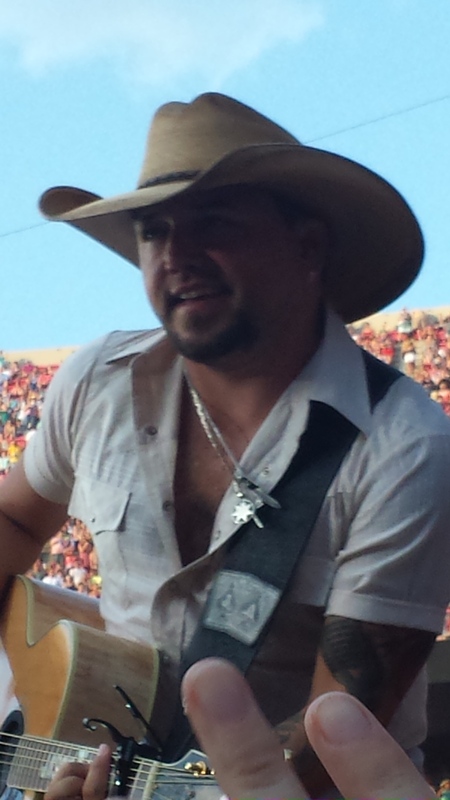 My wife mentioned Kenny Chesney and Jason Aldean were coming in August, I bought tickets. We were going. As the date of the concert grew closer, we found out there would be other bands. 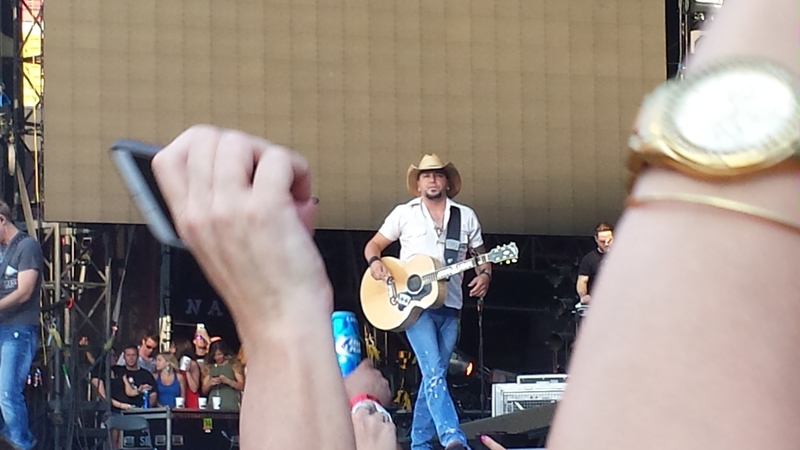 We weren’t just going to see Kenny Chesney and Jason Aldean, we were going to see five bands. It was going to be a long day/night for us. Arriving at the stadium (yes, it was an outdoor concert held in the football stadium) we made our way through the entrance and found our way down to the field. We went to the field because I decided if I was going to do this, I was going to get as close as possible to the stage. And we did. My wife and I both could easily reach out and touch the stage. First stop was the kiosk selling the requisite concert t-shirts and mementos. Then a quick stop for beverages and down to the field we went. Apparently, those two quick little stops took longer than I realized. 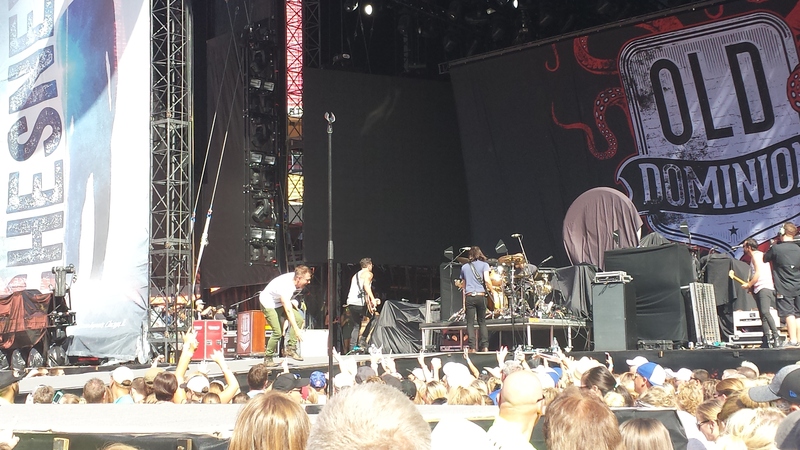 By the time we made it to the field and staked out our claim by the stage the first groups was finishing up their set. We did manage to catch a couple of their songs, though. As luck would have it, just as I snapped a pic, they all had their backs to the crowd. During Old Dominion’s last songs, I played with the settings of my processors to find where the music would sound best. After fiddling around for a few minutes, I found a sweet spot and left it there. 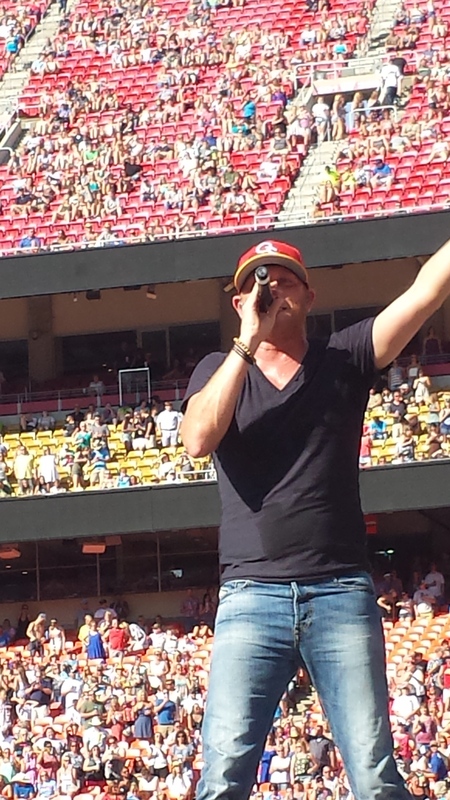 Next up was Cole Swindell. This guy was having a blast, there was no way for him to hide it. 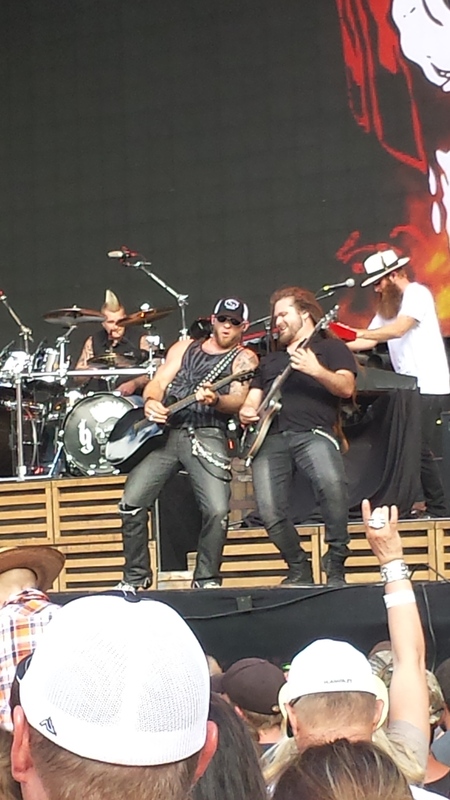 After Cole came Brantley Gilbert. 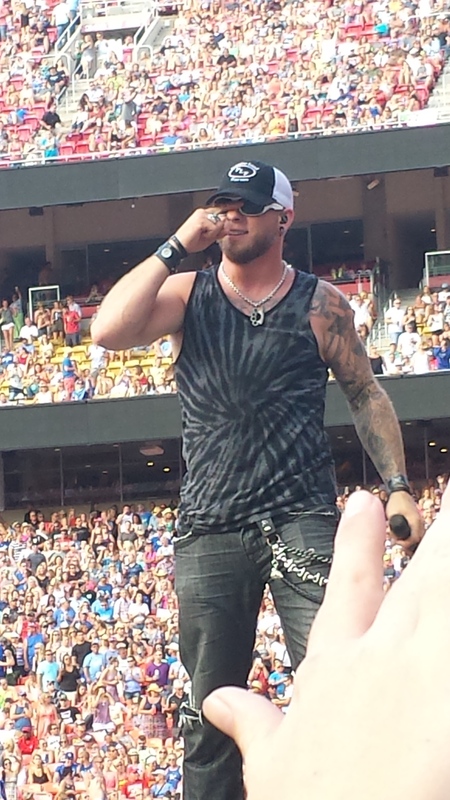 Brantley was another one who was obviously have fun that night. The main acts were still to come. 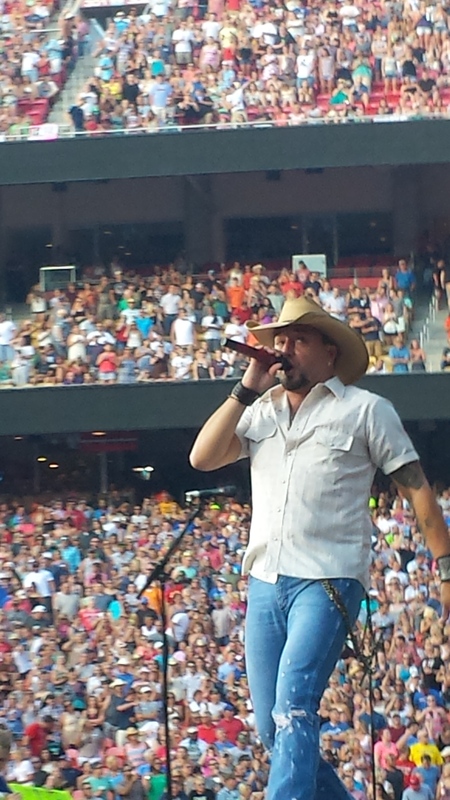 First up was Jason Aldean. I wasn’t really familiar with him other than recognizing his name. I have to admit, his music will get you moving, if it doesn’t, you probably should see a doctor. I know this isn’t the best framing with the two arms in the way but, I like how he looks in this picture. 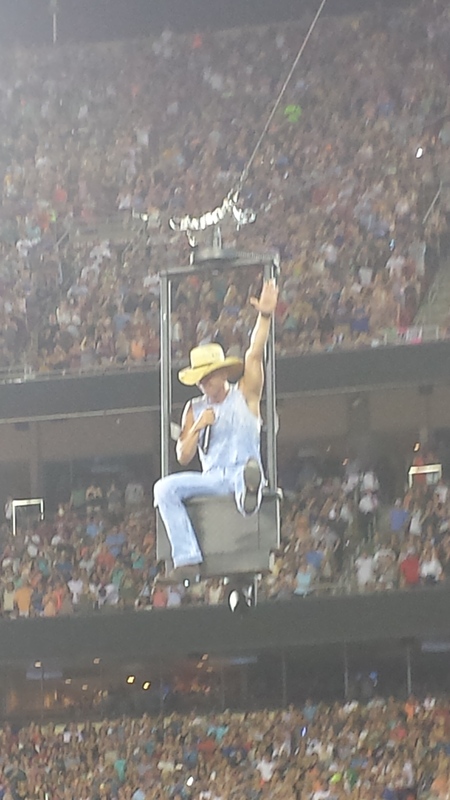 Lastly, Kenny Chesney. Sadly, these are the only two pictures of him I managed to get in focus, and they are poor pictures. This guy just moves around too damn fast and never stops long enough to get a picture. 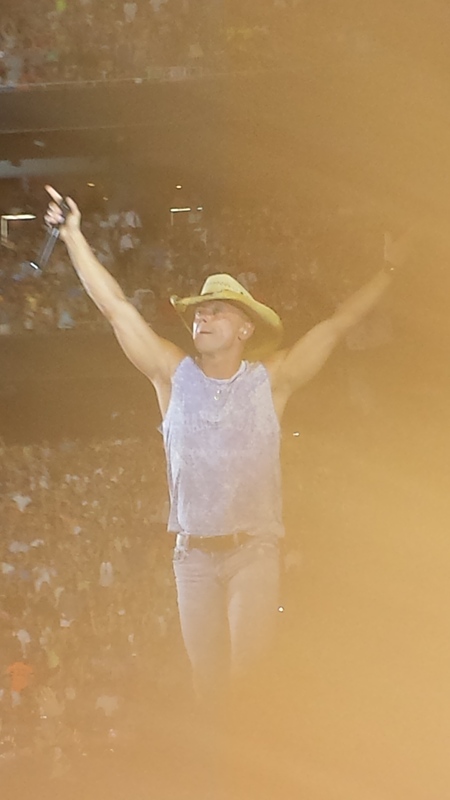 High Energy, that’s Kenny Chesney. It was challenging at first. As I mentioned earlier, I had to play around with the settings for my processors to find that sweet spot for the night. Then, since these were performers I was not familiar with, it took some time to recognize the nuances to their music. Overall, I thoroughly enjoyed the music and the night. And while I will definitely attend concerts again, I don’t think we’ll be getting that close to the stage again. We’ll leave that to the young’uns. Arriving at Mom’s in the late afternoon, we said our hellos and quickly unloaded and stashed our stuff. Once we settled in, Mom ordered a pizza from a local pizza place. As it turned out, you can pretty much get your pizza anyway you want so, we ordered a Spinach and Chicken Alfredo pizza. Mom had never had one, my wife and I love them. The pizza arrived quickly, was delicious, and won the approval of Mom. So, that’s a win. After pizza, we settled in to talk a little about our hearing. I say “our” hearing because Mom was implanted with a Cochlear Implant in January, just shy of four months after I was implanted. We talked at length about how much we had both been missing over the years and how much we have progressed since being implanted. I think she was using me as a gauge since I had such rapid improvement that first month after activation and was a little disappointed she hadn’t progressed as fast as I had. I reminded her, each activation is different and it really depends on the person. By comparison to some, I had an almost perfect activation. Compared to others, my activation was woefully inadequate. It all really does come down to the person and how quickly the brain adapts to the technology. That being said, I think Mom is doing wonderfully! We were able to carry on conversations without writing things down, without even rudimentary sign language, without constantly repeating ourselves. Yes, Mom is doing great! The next day was spent going through the “goodies” we received when we were implanted. I drug all my “stuff” with me so I could show Mom and we could go through hers at the same time. Like me, she has the Cochlear Mini-Mic and Phone Clip. She told me she had them but really didn’t know how to use them. After breakfast, and a trip to the fish market, you know the one where they throw the fish, we settled in for a learning experience. The first thing I did was make sure the Mini-Mic was paired with her processor. Then I showed her how to turn it on and to turn on the Mini-Mic accessory with her Remote Assistant. Once I knew she could hear it, I walked around her house, talking to her through the Mini-Mic. She loved it. I told her how she could use it in restaurants when she is out with friends, or, during her meet ups for a little wine and chit chat she can give it to others to use. The versatility is really only limited by your imagination. Then, I went one step further. Music has always been a big factor in my family. Growing up, everyone played at least one instrument. Mom played the piano and organ, I played the saxophone, other instruments played by family members included the trumpet, trombone, guitar (bass, rhythm and lead), percussion; I think every musical section was represented in our family. Losing one’s ability to hear music is almost devastating when it is such a huge part of your life. Bringing it back, there just isn’t a price to put on that. I turned her TV on and found a music channel playing classical music, as it happened, the piece playing at the time was a piano concerto (I don’t remember which one or who wrote it). I placed Mom’s Mini-Mic next to the TV speaker and in just a few seconds she looked at me and said, “That’s a piano.” That is a huge deal for someone who had not tried to listen to music for years, to identify an instrument the FIRST time listening to music, that is beyond description. Moving to her laptop, I showed her how to use the cable and plug the Mini-Mic into her computer, showed her how to navigate to You Tube and look up music and performances she enjoyed. Later, Mom told me she watched so many videos she had to recharge her Mini-Mic. Bringing music back to Mom, yes, that is definitely a win. We moved on to the Phone Clip. Mom had been having trouble using it so she had put it away. I took it and paired the Bluetooth with her phone, then the Phone Clip with her processor, showed her how to turn it on, then called her. While it wasn’t as big a success as the Mini-Mic, it was a success. We could talk to each other on our phones, something neither have been able to do for years. Finally, I showed her how to change to Mic covers on her processor. I had held off on changing mine as I wanted her to have to the chance to watch me then do it herself. Between the two of us, we had three processors to change the covers on. I showed her how on one of mine, then guided her as changed the covers on my second processor, finally letting her change the covers on her own. She passed with flying colors. Mom, was set. Now, don’t think all I did during our visit was teach her how to use her “stuff”. We had a wonderful visit and I hope we are able to do it again, soon. After the first night at Mom’s, we moved over to my brother’s house (he has more room and it was already arranged so I wasn’t abandoning Mom). At my brother’s house, I was introduced to Gunther. Sorry for the pic quality but it was taken rather quickly. 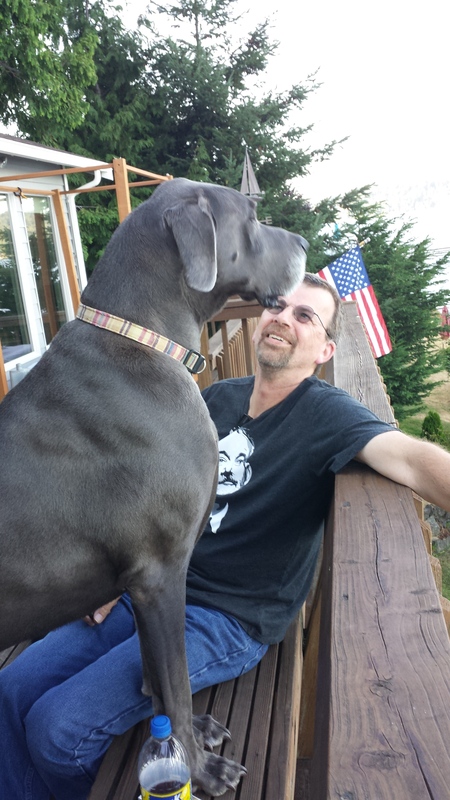 Gunther, as you can see is a Great Dane. A wonderfully loving, forgetful, Great Dane. Naturally, he didn’t know me when I arrived so, he was a little stand offish until he realized I was a good guy. Where he becomes forgetful is, the next morning he had no idea who I was. We had to go through the introduction phase again. My brother told me this was normal for him. He would forget people. Somewhat strange but, he is just too adorable. When we were not with Mom, we were enjoying this view at my brother’s. Yes, that is Mount Rainier in the distance as you look across the Puget Sound. Beautiful scenery. Sadly, our visit had to come to an end. After three days, we loaded up and headed South. After bidding adieu to the majestic sights in South Dakota, Wyoming, and our wonderful adventure with false fire alarms in Montana, we pointed ourselves west and continued on without incident through the beautiful countryside. Traveling through the mountains is impressive, the exposed stratification of rock jutting upward along with the vibrant shades of green is both awe inducing and dangerous. The passenger is able to enjoy all the beauty as it passes by the car window, the driver, not so much. With the roads twisting and turning, climbing and falling, switchbacks and blind curves, you don’t get to see much, just an occasional glimpse if you’re daring. Our destination in Washington wasn’t really Seattle, it was Bremerton, but most people understand where Seattle is, Bremerton, maybe not as much. Anyway, to reach Bremerton, we would need to turn left at Seattle, we turned right. A few weeks before we headed out on this adventure, a member of our travel group (yes, there are a few of us travelers that get together once every other month to talk about our travels. That way our friends aren’t subjected to the “evening social of travel pictures) mentioned a park just north of Vancouver, Canada called Capilano Suspension Bridge Park. I checked it out on the internet, you can too by clicking here. She gave rave reviews of the Park and was so enthusiastic about it, we turned right, instead of left and headed to Canada. I have to admit, it was well worth the time. 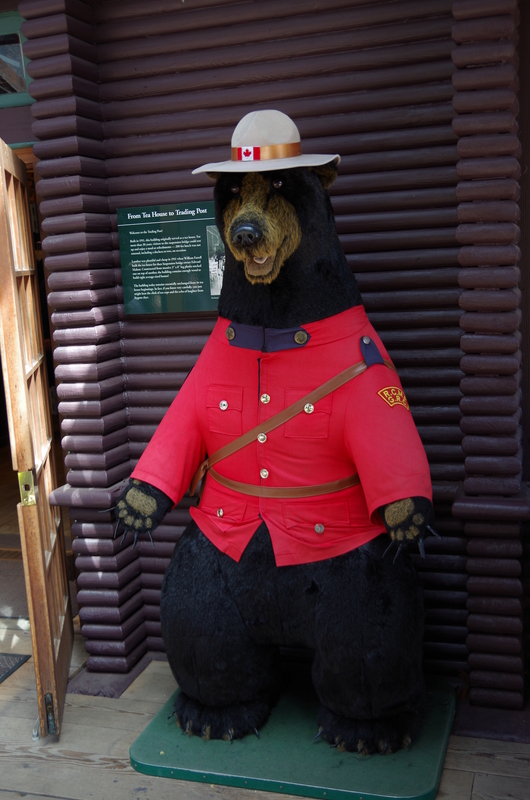 I imagine you’d like to see a couple of photos from our day in Canada, eh? 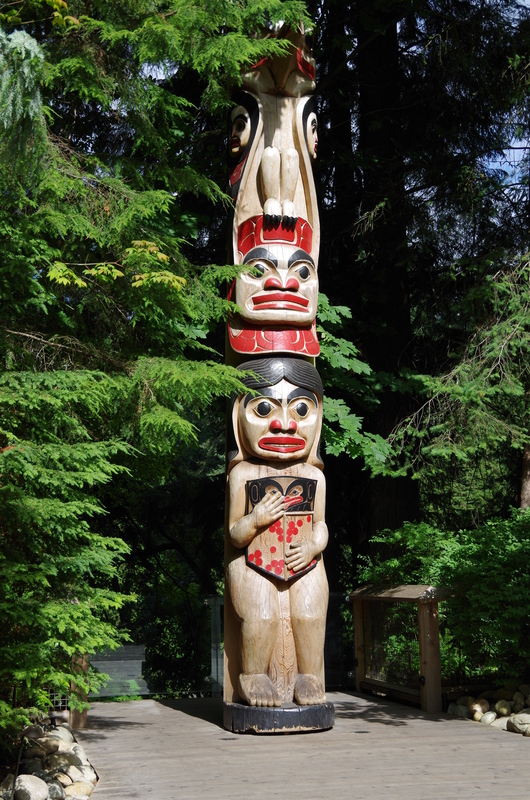 First entering the park, you are greeted by totems and a brief history to the bridge; take note, the suspension bridge has been hanging over the Capilano River since 1889. Once inside, you have a couple of choices to make. 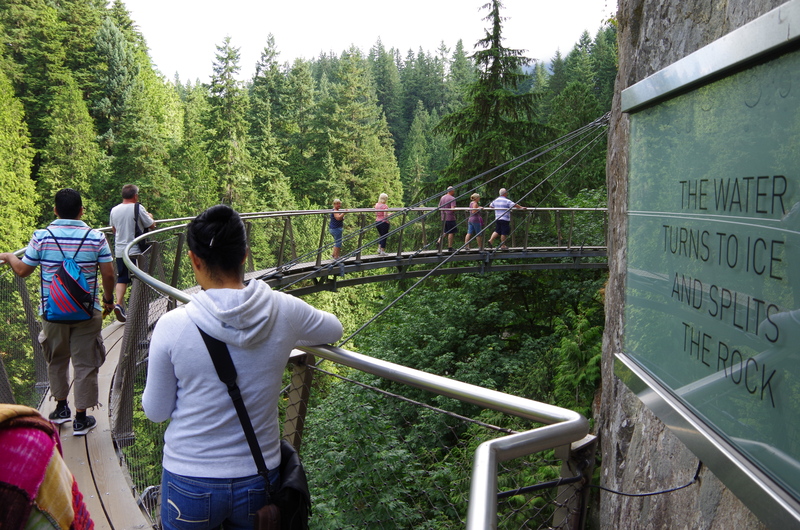 Do you head straight to the Suspension Bridge or head over to the Cliff Walk? We opted to walk the Cliff Walk first. 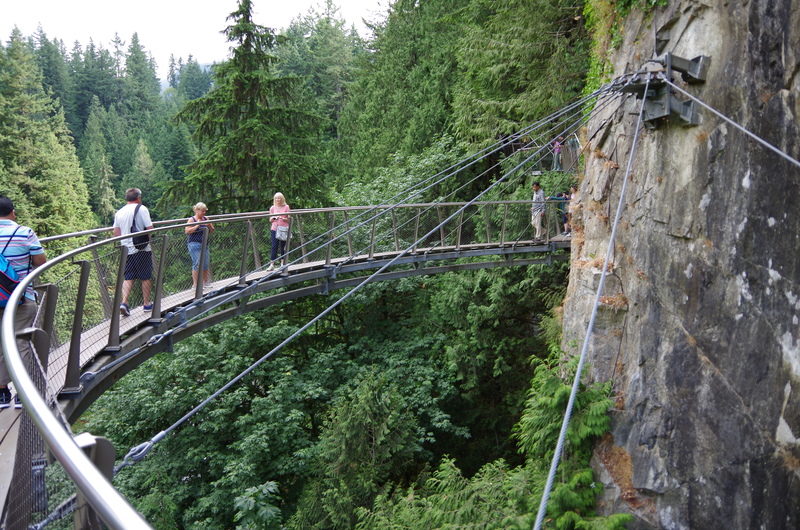 The Cliff Walk is a serpentine series of walkways and platforms extending from the side of a cliff, as the name suggests. It is very narrow and very cool. 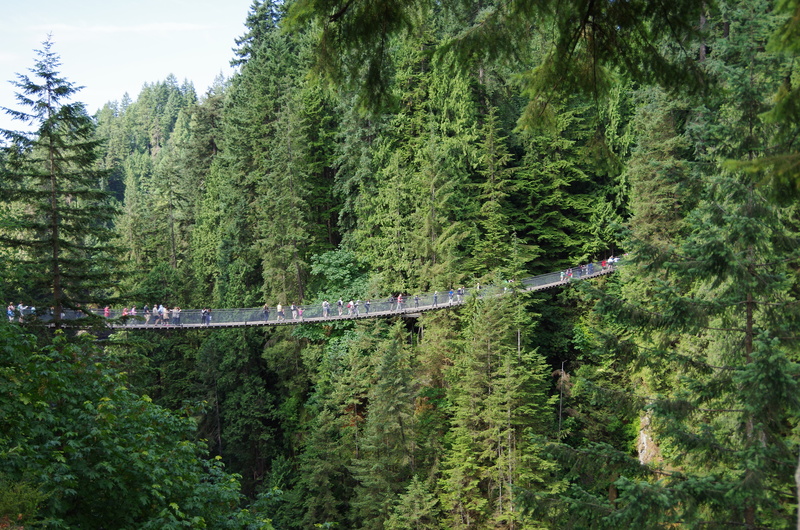 The Suspension Bridge was next. 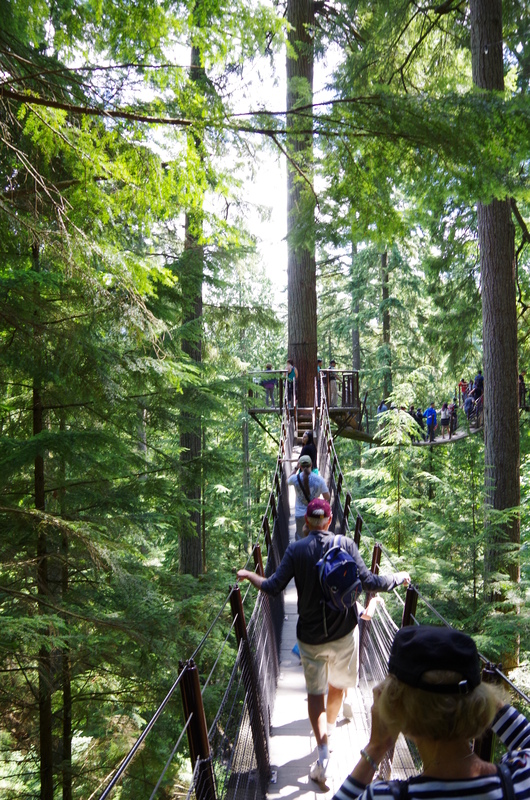 Once across the bridge you can head up to a series of suspension bridges that link through the treetops to give you a squirrel’s eye view of the area. This was all very cool and since we did it early in the morning, the temperatures were very comfortable. I will say this, if you are not in reasonably good health, be forewarned, the climbing and walking can be strenuous. 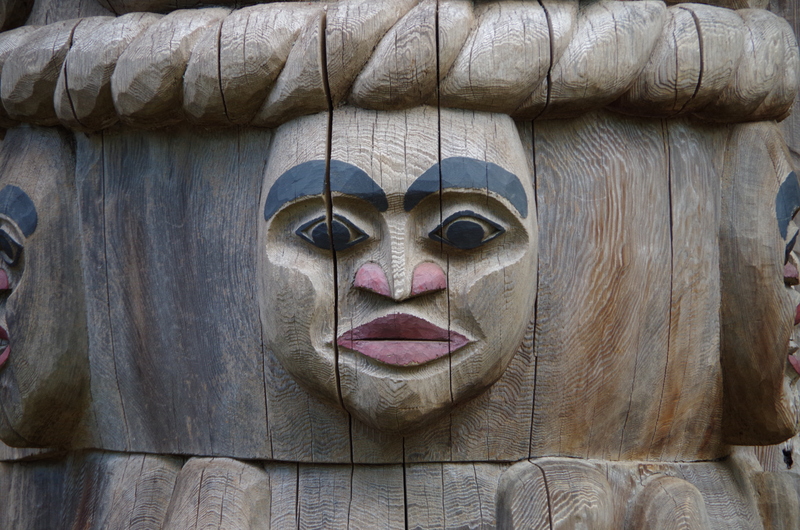 Once our day here was completed, I just had to take a picture of this guy standing watch outside the gift shop. We completed our reason for traveling to Canada, it was time to head south and meet up with family. Heading South on I-5 from the Canadian Border to Seattle is pretty uneventful, until you get closer to Seattle. Traffic is horrendous! I took I-405 thinking it would loop around Seattle and not be as bad as navigating I-5 through Seattle. Turns out, it made no difference. We were not in rush hour traffic however, it was bumper to bumper, stop and start. I jumped over to the HOV lane thinking it would move quicker. Imagine my consternation when the non-HOV lanes were moving faster than I was. Lesson learned, definitely find a route well away from Seattle next time. I don’t know how many have seen the video footage of the bridge of the Tacoma Narrows collapse back in 1940, if you haven’t seen it, you can watch it here. I bring this up because, to reach my destination, I had to drive over the bridge. Obviously, the current bridge is a replacement to the original, but the video played in my head while I crossed it. 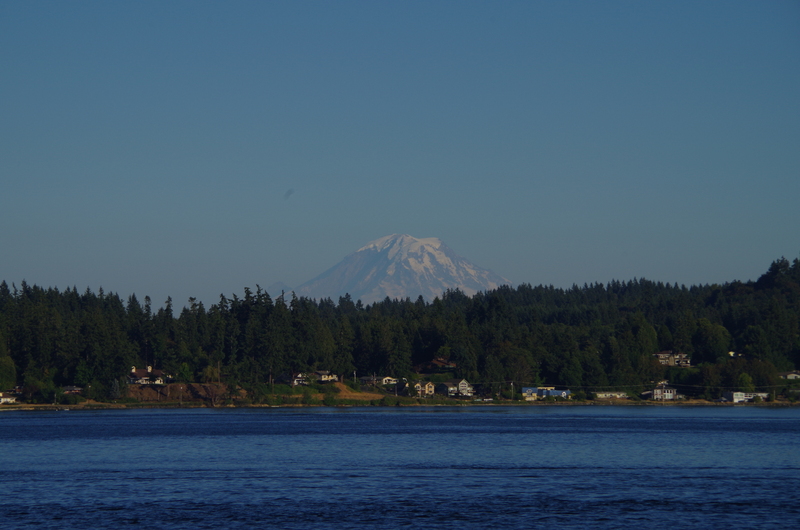 After safely crossing the Tacoma Narrows bridge, it was just a few miles further to Mom’s house, our destination for the night. 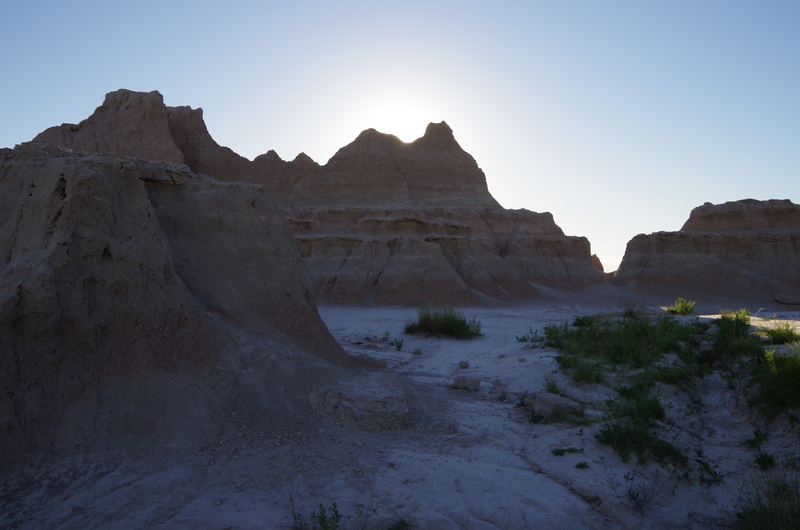 As it turned out, our stopping point the previous night was not far from Wall, South Dakota. If you’ve ever traveled I-90 through South Dakota, I’m sure you’ve seen the billboards advertising Wall Drug. 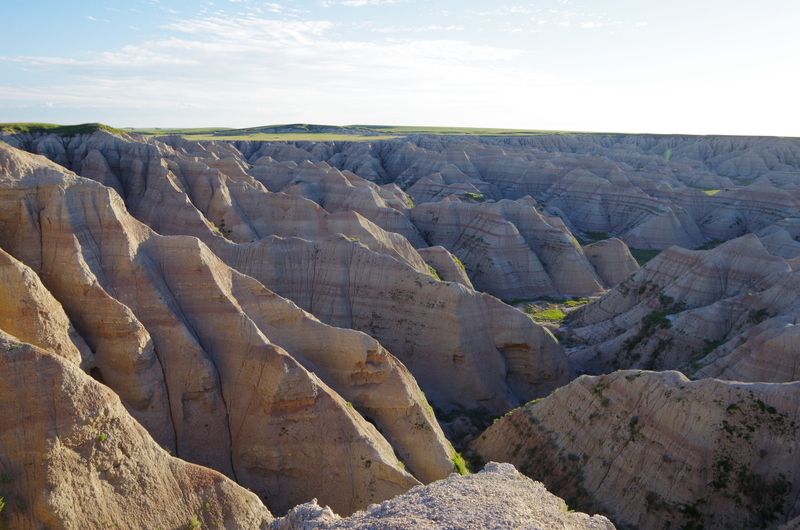 Throughout the U.S. you occasionally see bumper stickers declaring, “Where the hell is Wall Drug?” As it turns out, it’s on the main drag in Wall, S.D. and is a popular tourist attraction. Without spending too much time on the history, the success of Wall Drug, and quite possibly the town of Wall itself, is all due to free ice water. We stopped at Wall Drug for breakfast and a little sight seeing. Breakfast was good, it is buffet style, grab what you want on your way through. They even still have serve yourself coffee for a nickel. Even though Wall Drug has become a roadside attraction, it still maintains an actual drugstore. Not a bad little stopover for breakfast. 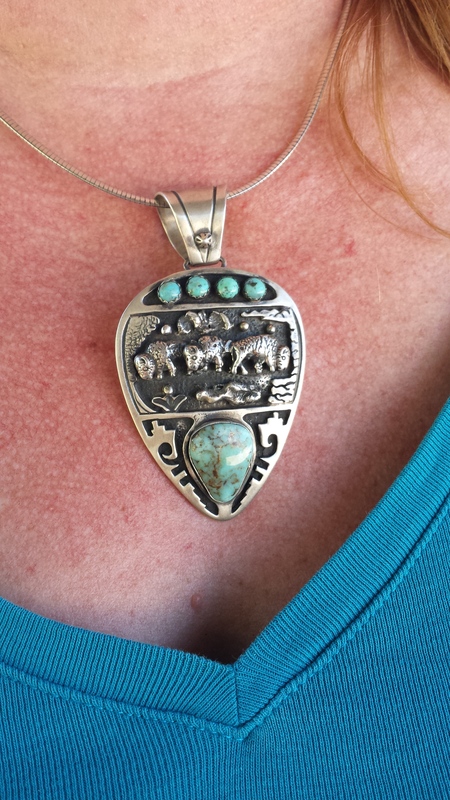 Across the street there were several shops, one of those shops has an excellent stock of Native American jewelry. Of course, we had to stop in. And this is what my wife came out with. After browsing a few more shops, we decided to head down the road. 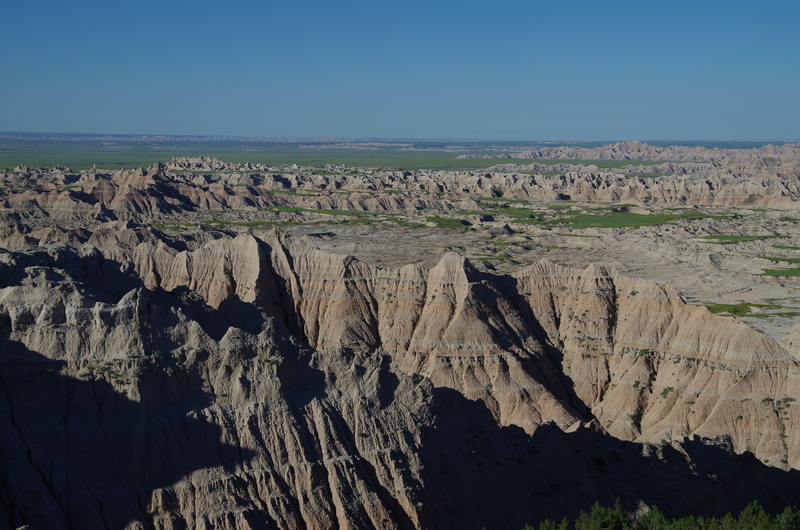 Our first stop was the Badlands. Just a quick turn off the interstate and you step back in time. Just imagine the Old West. Here are a few photos to help. Beautiful drive through this country. Admittedly, I got a thrill out of using my National Parks Access Pass so, it was free! If you live in the U.S. and have a hearing loss, you can qualify for a lifetime pass to our National Parks. This was the first time I used it, yeah I admit, I was a little giddy. Our next stop was Mount Rushmore, definitely worth the drive to see it in person. Photographs really don’t do it justice. 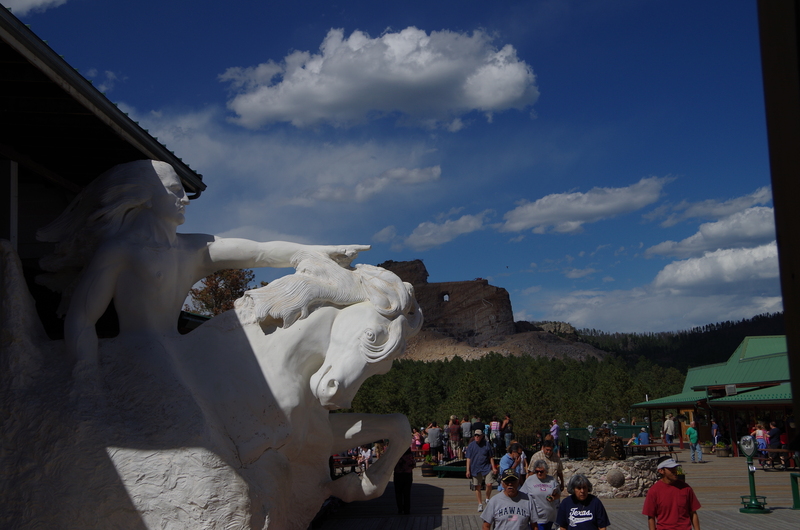 After you visit Mount Rushmore, you’re only about 20 minutes away from Crazy Horse Monument. 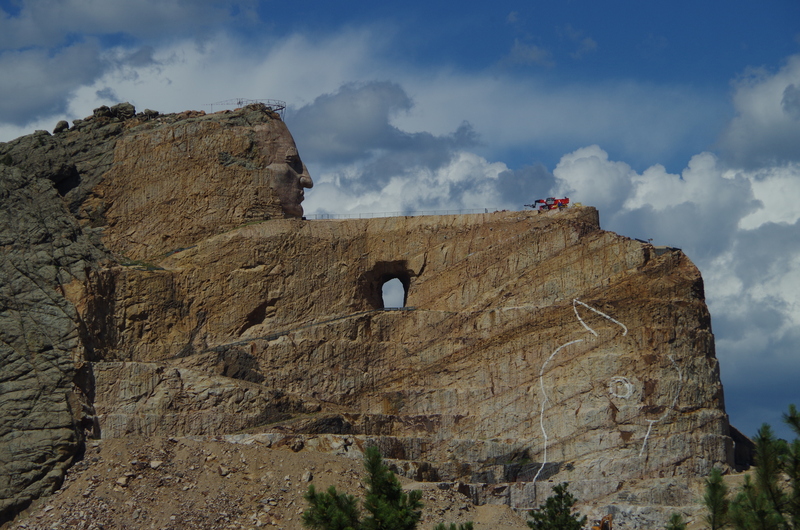 Crazy Horse Monument is the worlds largest three dimensional mountain carving in process. 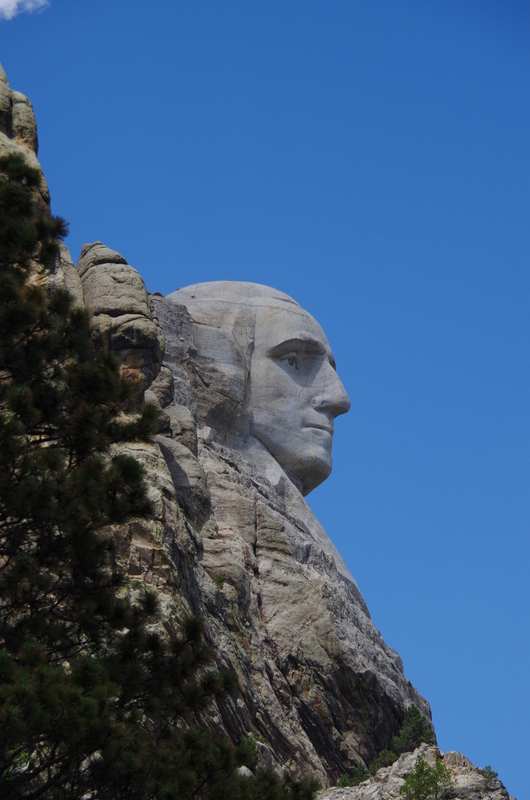 To give you an idea of its size, Mount Rushmore could fit in the area being carved for Crazy Horse’s head and hair. Needless to say, this carving is huge! 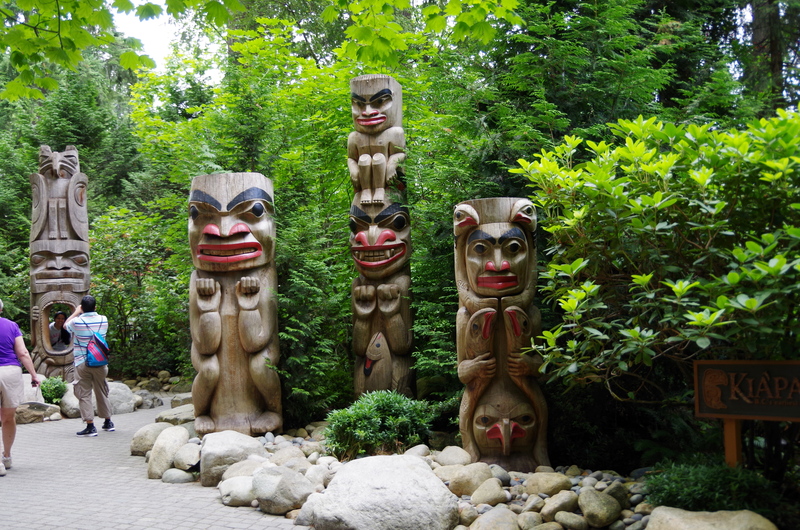 The information and cultural center is great for Native American history and, of course, there is a gift shop where you can pick up a memento of your visit. After Crazy Horse, we headed to Wyoming to visit Devils Tower. As a natural geologic formation, Devils Tower is impressive. An interesting fact about Devils Tower, it is considered sacred by several Native American tribes and is called Bear Lodge, Bear’s Hat, Place where bears live, Rock Tree, Bear’s Tipi, Bears’ Home, and Place where bears live. 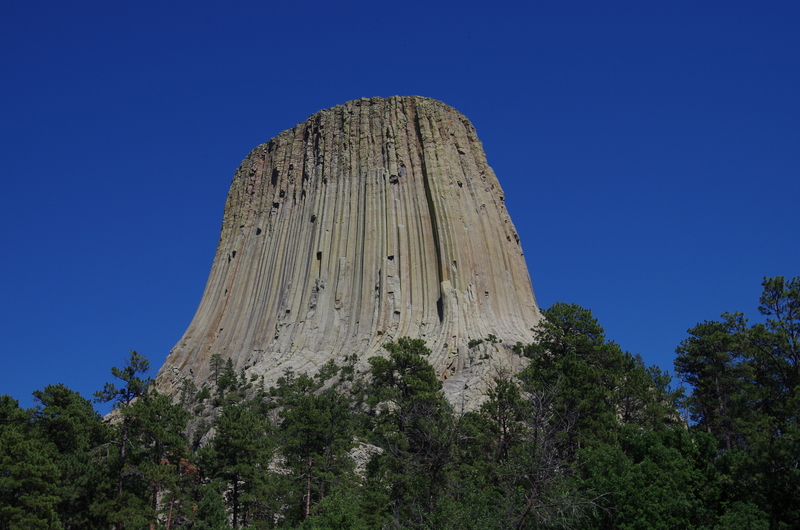 It wasn’t until 1875 it became known as Devils Tower when Colonel Richard Dodge visited during a geological expedition. He named it Devil’s Tower, for unknown reasons. Later, a clerical error left the apostrophe out, it has been know as Devils Tower ever since, at least among the tourists and the government, that is. It was a very full day of shopping, monument visiting, general sight seeing, and driving. We really didn’t get all that much closer to Washington but we had a great time. We did have luck that night, we found a hotel in Billings, Montana with rooms available. I took a quick shower and crawled in to bed while my wife took her turn in the shower. I rolled away from the light, regaining more of my awakened state, I see my wife on the other side of the bed throwing her clothes on. I ask her what’s going on, she states “Fire”. Then it dawned on me, the flashing light was the fire alarm. Having taken my processors off, I couldn’t hear anything, hence the rather forceful smack. I jumped up, threw on some clothes, grabbed my processors and headed for the door. Turning around, I noticed my sweet wife is packing. I quickly inform her to leave everything. Nothing in that room was that important. We, along with the rest of the hotel, congregated in the front parking lot. The police and fire departments arrive, sweep the hotel to ensure no one is left inside. And announce, there is no fire and it was safe to return to our rooms. Apparently, one of the other guests, being somewhat inebriated, pulled a fire alarm. Whether on purpose or not, we never found out. I will say this, the hotel staff did everything right. The building was evacuated quickly, and there were no injuries. Pure professionalism on their part. In case anyone is interested, the hotel is named My Place and I wholeheartedly recommend it. Clean rooms with a small kitchen area and very reasonable rates. A little warning before you continue. This little bit of a story could be lumped into the category of toilet humor. It happened in a roadside rest stop, in the bathroom, and is humorous, in retrospect. So, if you think this topic is not to your tastes, you have been forewarned. We crossed into Wyoming and stopped at the Tourist Information Center/Rest Stop to pick up a state map. We’re collecting maps of all the states we visit, don’t ask why, we just are. Anyway, I felt the need to use the facilities and entered the men’s room. I was greeted with what can best be described as prison commodes. Stainless steel fixtures hanging from the wall. Not being a fan of just sitting on any toilet seat, I use one of those sanitary coverings you find on the wall. I sit down and immediately feel my … um … manly parts become cold and wet. Quickly standing back up I notice the water level in the commode is almost level with the brim. So, there I was, standing, pants down, my manly parts wet and cold, and I still need to … well, you know. Quite a conundrum. Not to be deterred from relieving myself, I turn around, gather my manly bits in one hand and sit back down. Needless to say, this was not the most pleasant experience I’ve ever had in a rest room. After meeting up with my wife and relating my rather wet and cold experience, she supported me in my discomfort by doing what wives do in situations like this. She laughed. As always, the best laid plans never really go according to plan. Our plan was to leave early Saturday morning, the 11th of July. I think everyone who has ever taken a road trip understands the plan. 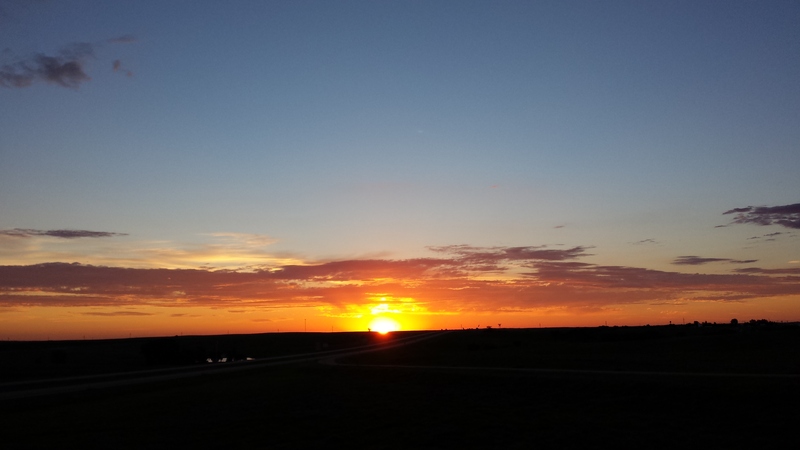 Get up early, hit the road and put as many miles behind you as possible before stopping for the night. As I’m sure you’ve guessed … that didn’t happen. If I remember correctly, we didn’t “hit” the road until around 11:00am. 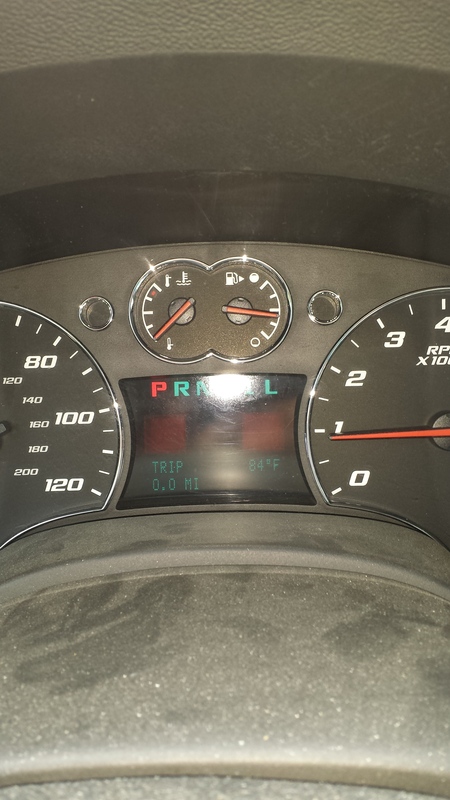 I set the trip odometer to zero and off we went. We both knew the only hard set “plan” was to arrive at my brother’s house in Washington sometime the following week so, getting a late start wasn’t all that bad. It just meant I would be spending more time in my home state of Missouri than I planned. 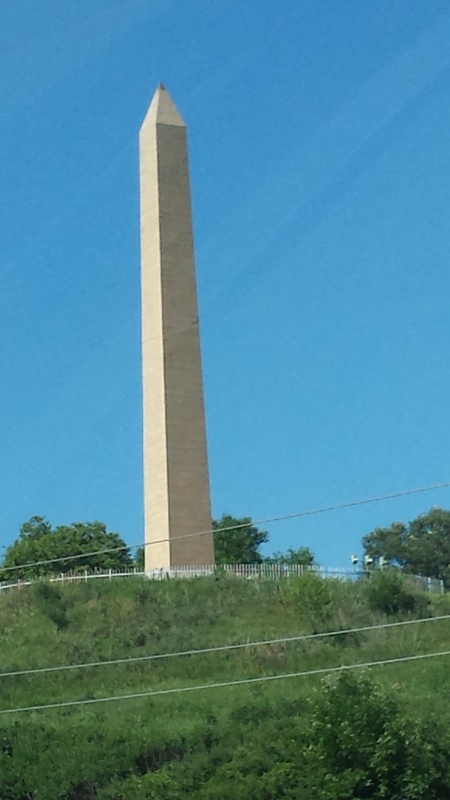 This obelisk is actually a monument to the only person to perish during Lewis and Clark’s expedition, Sergeant Floyd. The monument stands approximately 100 feet tall and is actually Sgt. Floyd’s third resting site. If you stop, be on the look out for a 15 starred and 15 striped flag, pretty cool. The other interesting feature in Iowa is the Loess hills. This isa geologic formation that only exists in two places on earth. Obviously, one place is Iowa, the other is in China. Loess doesn’t support agriculture, but the hills can be mined for gravel and fill dirt, which is controversial and I’m not going to get in to that argument. 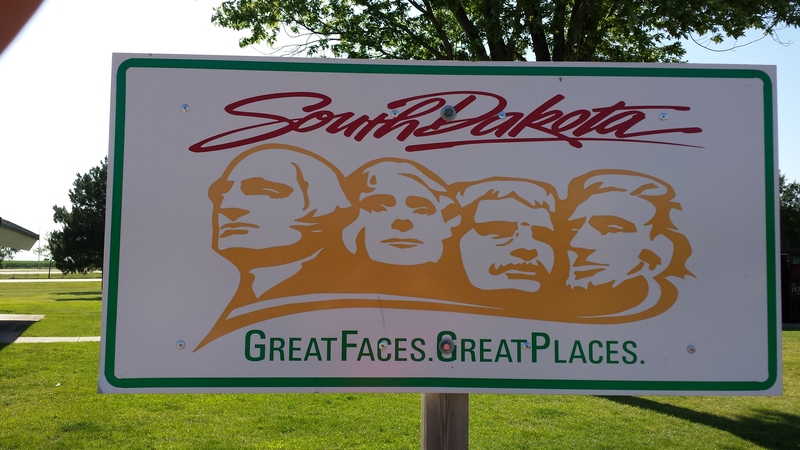 We made a left turn and were welcomed to South Dakota. 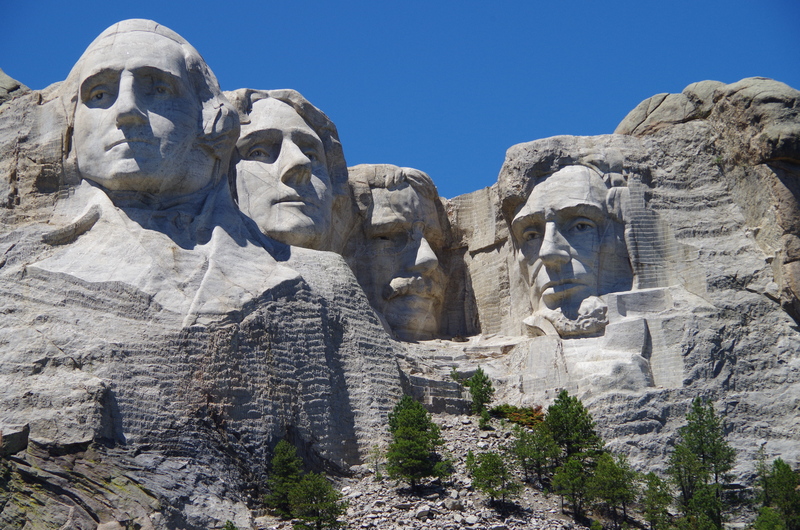 Of course, our destination was Mount Rushmore, way on the other side of the state. Fast forward to our first night, time to stop and get a room for the night. Simple, right? We stopped at three or four hotels, each of which informed me there was no vacancy. Thinking there was something special happening in the area, possibly something to check out the next day, I asked the last hotel clerk if there was some festival or something, I was told this was normal for them during tourist season. That was it, just tourist season. He was kind enough to make a few phone calls and find a hotel with two rooms available, two hours further down the road! It was already around 11:00pm and we were too tired to drive any further, safely. So what to do? Find a group of semi-trailers parked for the night, pull in the middle of them, recline the seats and get some sleep. Yep, the first night on the road and we slept in the car. Now that would be the end of the story for MOST people but, you’ll find I’m not most people. First, my wife has normal hearing, pulling between tractor trailers wasn’t an issue for me, I took my processors off. My wife however, had to listen to what she described as the T.A.R.D.I.S. all night. For me, pure silence. And then, there is the really unusual part of my sleep pattern, I sleep sitting up. Sometimes. During the night, I will sit up, cross my legs, lean forward, and put my head on the bed. I do this completely asleep, I don’t know why but I’ve slept this way for as long as I can remember. That night, in the car, between idling tractor trailers, I set up, leaned forward, and put my head on the horn. Thankfully, my dear wife woke me up before I woke up the neighbors. I can’t imagine how they would have reacted being woke up by my honking in my sleep. We woke early in the morning, found we had parked for the night within walking distance to a convenience store/gas station. Wonderfully convenient for morning coffee and, well … morning visits to the restroom. While sleeping in the car wasn’t exactly our plan for the night, we were greeted with this view. Ya just gotta love a woman like her. Yes, I have been quiet, but I have a good reason. As told on my Facebook and Twitter pages, my wife and I took a much needed two week vacation. I had intended to post updates along the way however, after a few days of driving, I honestly felt more relaxed without checking in and sharing everything. And, relaxation is what vacation is supposedly about. But, wait, you may say, it’s been three weeks since your last post. Why didn’t you update the blog when you came back? The answer to that question is that task awaiting you when you return from vacation … work. It took me an entire week to catch up on everything that occurred while I was enjoying the Pacific Northwest. My wife and I decided to drive for this vacation, we wanted to see the countryside. Stop when we wanted, without a preconceived plan. We had a few sights we knew we wanted to stop for, Mount Rushmore and Crazy Horse mountain carvings in South Dakota, Devils Tower in Wyoming, Capilano Suspension Bridge Park in North Vancouver, Canada, the Puget Sound in Washington State, drive the historic Pacific Coast Highway, Highway 101, and the Redwoods in Northern California. We did experience all of it, and some unexpected places along the way. I will fervently begin putting all this into several posts over the next few days. While not everything during the course of our vacation is deaf of hearing related, there were several moments that were relatable to being deaf/hard of hearing. Lastly, I’ll cap the posts with what we did last night, we attended the first concert since I was implanted. I will share with you my experience, both good and bad, listening to live music with cochlear implants. Stay tuned. First, while I was in court today, I was there as a witness only. Just wanted to put that out there. The circumstances leading up to this day occurred about three or four weeks ago. During my morning commute, I witnessed an accident, as a generally caring human being, I stopped to see if I could help. Thankfully, there were no serious injuries I could see, I did make sure an ambulance was called just in case. I stayed at the scene until the police arrived and gave them my statement, the officer thanked me and sent me on my way. Less than a week later, I receive a summons to appear in court as a witness. That brings us to today. At this point the prosecutor said something but I couldn’t understand her. Me – “Yes, it’s because I have cochlear implants.” I then turned a little to show him my processors and coils. And that was all it took, I spent the next ten minutes standing before a judge, a prosecutor, a clerk, and a bailiff showing off my processors and explaining how they worked. The judge kept saying it was all “Amazing”, and it is. For me though, the amazing part of the day was educating a small portion of our judicial system on cochlear implants.